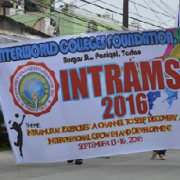 The Interworld Colleges Foundation, Inc. (ICF) celebrated the 2016 Intramural Games last September 13-16, 2016 with the theme “Intramural Exercise: A Channel to Self Discovery and Interpersonal Growth and Development.” It was held at Paniqui Public Auditorium and Doña Lualhati Cojuangco Gymnasium. The day started with the parade around the town assisted by the ICF Drum and Lyre Corps followed by the ICF family – students from elementary, junior and senior high school, college department, as well as the teachers and staffs. They all attended to show their support and appreciation for the opening celebration of the 2016 Intramural Games. The parade started at 7:45 am in little Quezon (in front of ICF Annex) and ended at the Paniqui Public Auditorium. While the students were entering the auditorium, the masters of ceremony acknowledged every department and you can see the happiness and excitement on their faces. Every supporter went directly to the bench, choosing the possible best spot to watch. The official opening program was started by a prayer, followed by the singing of the Philippine National Anthem and ICF Hymn, led by Ms. Jessica P. Flores (a high school teacher) and assisted by the ICF Drum and Lyre Corps. Dr. Florentina F. Aquino, the college guidance counselor, gave her welcome address. The lighting of the torch was done by Vivien dela Cruz from Accountancy Department and the pledge of amateurism was led by SBO President Daryl Facun. The search for Ms. Intramurals followed. Each lovely candidate showed their gorgeous walk and they proudly represented their beloved departments. And out of this candidate, only one can bring home the title. Catherine Beltran from grade 11- A was proclaimed Ms. Intrams 2016. In the afternoon, the most awaited part of the program continued. The highlight was the Hip hop Dance competition by the different divisions. The usual competition was cheer dancing but they have decided to divert to a more exciting one. Each department prepared for presentations. They did all their best hoping to bring home the honor. And the breath-taking part of the program was the announcement of the winners. For the Junior High School,Grade 8 got 2nd place, Grade 9 got 1st, and Grade 10 proclaimed as champion. For the Senior High school, and college department, Education Department got 3rd place, CBA took 2nd and HRS 1st place. Spectators applauded the winners and congratulated all the students and participants for the job well done and amazing talents. The program ended by awarding the plaques of appreciation and tokens to the judges, as well as to the winners of the competitions.